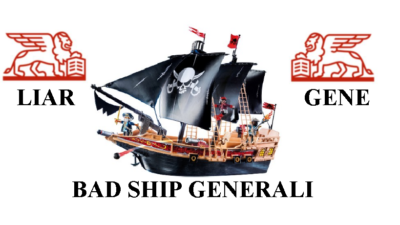 Generali – jumping ship to avoid new regulations? The mis-selling of life assurance policies and long-term savings plans has been a regular topic in our blogs. Many victims of pension scams see their funds mis-invested into life assurance policies. These life assurance policies do little more than drain the fund value with their expensive fees and costs. 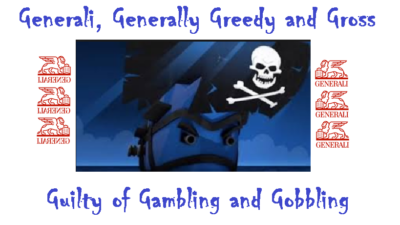 Generali has for years been aggressively peddling these toxic products. Interestingly, they have just pulled their contractual savings plans – Vision and Choice – from the UAE market. Interesting and attractive names for profoundly ugly, expensive and destructive products. We have to wonder if all the negative press surrounding Generali’s life assurance bonds has anything to do with it? Since 2016 there has been a huge rise in complaints surrounding the mis-selling of these products. With huge, concealed start-up costs, the funds rarely ever reach their original investment amount, let alone make a gain. Furthermore, there has been a third push on regulations to improve how savings, investment and life insurance policies are sold. AND the Spanish insurance regulator (DGS) just confirmed that all such products sold in Spain have been done so illegally But Mr Vitiello of Generali claimed their decision to stop selling the Vision and Choice products in the Emirates was not linked to the new regulations. REALLY?!?! “We will not be accepting any new business applications for our current unit-linked saving products,” said Vitiello – General Manager of Generali’s Dubai branch. “There will be no impact at all to existing clients and contracts. They will continue to be serviced in the same manner as before.” In other words, they will just keep on losing money, being tied in for an unacceptable length of time and paying extortionate charges. We wrote about the proposed merger between Generali and Utmost Group back in August 2018. The Utmost Group now has over £33bn in assets under administration and over 240,000 customers. 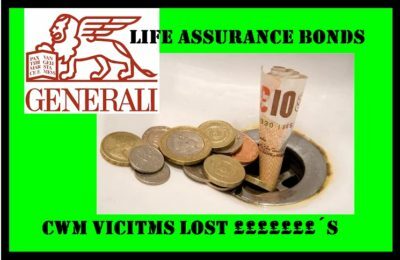 We can only hope that customers of The Utmost Group will not become victims of mis-sold life assurance policies like the ones of Generali. Generali was one of the culprits involved in the huge Continental Wealth Management pension scam, which saw as many as 1,000 victims, invested into high-risk, toxic, professional-investor-only structured notes. Whilst the bulk of the victims were placed into OMI bonds, at least 25 (but probably nearer 100) of the victims were placed into Generali bonds by the scammers. The sum total of 25 pension funds invested into these toxic insurance bonds was a whopping £6,314,672. The losses on this amount are calculated to be approximately £3,604,528. One victim invested £793,612 and has just £62,703 left! Losing a massive £730,909. Another victim invested £142,626 and has lost £90,618! Leaving him with a fund of just £52,028. Please note these figures are correct as at 2017/2018, so today’s value is now even lower. Despite the funds’ huge decrease in value, Generali continues to take their fees (based on the original amount deposited – not the current depleted value). Therefore, these amounts will continue to fall AND despite the massive loses be locked in for a fixed term. It is, of course, a relief to know that they have decided to stop peddling these toxic, inappropriate bonds to victims. But we can’t help wondering why Generali have suddenly done this and really feel for those already caught up in these bogus “life” policies. Seems to us Generali are jumping ship to avoid the new regulations. With sudden revelations that maybe they should have checked all the details just a little bit more – and declined to take business from unregulated scammers. As Generali are busy making changes and sales, we can only hope that compensating the victims of the CWM scam is on their to-do list. As they have sold their entire shareholdings, you might think that an honest firm would want to make right the wrongs they have done. Not only did Generali allow these 25 victims to be put into wholly inappropriate funds and high-risk structured notes, but these investment instructions were also accepted from unregulated advisers. The scammers were paid high commissions by Generali and there is no sign of any remorse for the huge losses suffered by the victims. What we do know is that victims are now preparing their complaints against Generali and CWM. The DGS has found that there is no doubt that the regulations of sale surrounding these products were breached by Generali. Generali are not the only life office guilty of financial crimes: Old Mutual International and SEB were even worse – facilitating losses on a massive scale in the Continental Wealth Management case. OMI bought £94,000,000 worth of ultra-high-risk structured notes for retail investors – resulting in huge losses. Old Mutual was also heavily involved in more than £1,000,000,000 worth of losses in the Axiom, LM and Premier investment scams. Seems it is no accident that “Generali” is an anagram of “Liar Gene”.